KrisAnne Weiss and Tess Altiveros in Skylark Opera's production of Così fan tutte, 2019. Photo courtesy of Skylark Opera. Skylark Opera, formerly known as the Opera St. Paul, presented an english abridged version of Mozart’s youthful Cosi fan tutte in an intimate setting at The Historic Mounds Theatre. The company used the translation by Ruth and Thomas Martin, but cut the recitatives and replaced it with dialogue written to fit the vision of the production. Stage director Robert Neu envisioned the opera in present day New Rochelle, New York. (I never fully caught the significance of the specific setting noted in the program.) The stage was set with the piano in the middle and then stairs leading down to a catwalk that went through the audience. It was a little jolting to start hearing contemporary dialogue right off the bat, but it was actually quite seamless. For example: Ferrando and Guglielmo have been drafted to “build the wall!” Needless to say this kind of updating earned uproarious laughter. 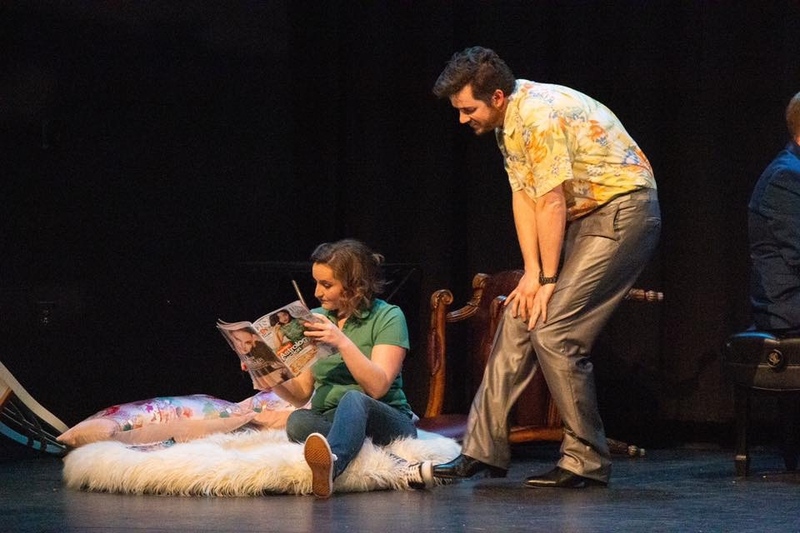 Siena Forest and Luke Williams in Skylark Opera's production of Così fan tutte, 2019. Photo courtesy of Skylark Opera. Tess Altiveros, sang the demanding role of Fiordiligi. Laurent Kuehnl sang Ferrando and Justin Spenner sang Guglielmo. KrisAnne Weiss played Dorabella with a mohawk and girl power outfits. Don Alfonso, sung by Luke Williams, portrayed as a flamboyant and sexually fluid art dealer from Soho. Mr. Williams gave a full bodied confidant sound that grounded the ensemble. I felt that underneath the entertaining antics of the cast there was a message to be gleaned from the night, but it was never given the time to come to fruition. Mr. Kuehnl sang a heart wrenching “Un aura amorosa” with genuine feeling that had the audience enthralled, but those emotions were never seen again. Guglielmo simply got up and shrugged leading his friend off stage. The highlight of the production was Siena Forest who played the housekeeper Despina. Her voice had a shimmering bite to it that perfect for the role. She and Don Alfonso had a sexual “friends with benefits” relationship, which is not unheard of in Così productions. Despina then sits at the edge of the stage head in hands lamenting on how “tricks you play on other people are also played on you.” I was really intrigued by this tense ending between Despina and Alfonso, I just wish it hadn’t been so out of the blue. The relationship and its issues could have been brought out more throughout the opera. 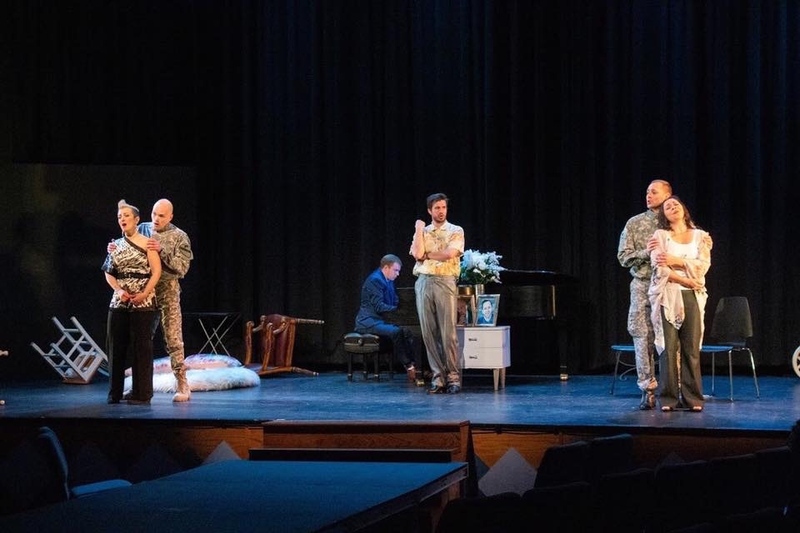 KrisAnne Weiss and Laurent Kuehl, Luke Williams, Tess Altiveros and Justin Spenner; Nathan Cicero (Music Director) in Skylark Opera's production of Così fan tutte, 2019. Photo courtesy of Skylark Opera. The opera was sung with a piano and no conductor, and to the credit of music director and pianist Nathan Cicero the ensemble never got off. It was curious that the piano was only at half stick, I feel that the singers did not sing out enough because they lacked sound behind them. Additionally, the singers may have held back because of the very intimate performance space, and the audience missed out. I appreciated the company’s initiative to save paper by not doing paper tickets (who really keeps their ticket stubs?) or lengthy programs. I look forward to what Skylark has to offer Twin Cities opera goers in the future!